The annual report features a striking new cover and a design that is reflective of the quality that Fugro as a company offers. The online version quickly guides readers through the essential information in the report. An independent specialist, Fugro is a world-renowned name when it comes to dealing with geographical issues. 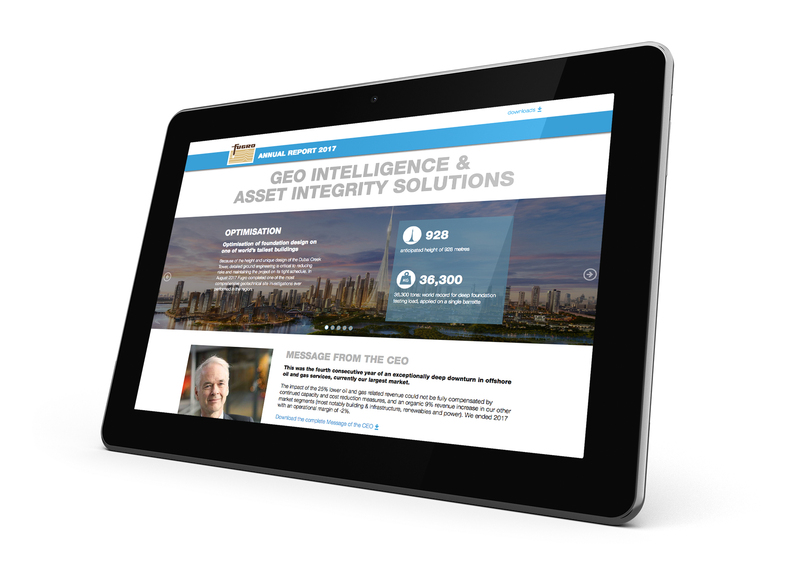 A leading service provider in geo-intelligence and asset integrity solutions operating in construction, infrastructure and the energy industry. Fugro’s annual report had looked the same for many years; the design did no longer reflect the newly enhanced communication strategy. The company wanted to convey their business as clear as possible. However, the work is highly specialized and hard to explain in every day words. The new annual report has become an opportunity for communication. The report’s design became more modern, accessible and clearer. Infographics, icons, images and themes helped visualize their core activities and results.